Recently we made some changes to how PreSonus customers access self-help information for their support questions. 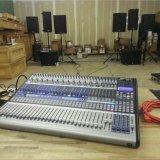 We changed the link to the forum from our main page to our Answers Site, as our focus on where PreSonus support can be of assistance has shifted. PreSonus Support's focus is now on providing information through our support portal, knowledge base and our Answers-based help pages and through social media. Over the past few years, customer use of social media has increased, shifting our participation to FaceBook groups and away from the forum. The Community Moderators have continued to work with PreSonus support to uphold and maintain the forum. Starting in May, May, the forums will continue to operate with Community Forum Admin oversight. The community is still welcome to gather and discuss here, just as it has been doing for a long time. The day-to-day activities of the forum will now be run by community-elected administrators, super moderators and moderators. The forum can be found by visiting it the direct URL at https://forums.presonus.com. We suggest book marking it in your browser. Other companies may provide support solely through their forums. For anyone coming here expecting PreSonus to be present to respond to their inquiries should know that only the community will respond. If one is looking for an "official" response from PreSonus for any particular issue they should log a support ticket through our Customer Support Request Page. If you want to mingle and interact with PreSonus, please visit us at our PreSonus FaceBook Page or participate in one of the many closed FaceBook Community Product groups where PreSonus staff is already active. Going forward, the Community Admin's, some of whom own their own FaceBook groups or Web Blogs, will be working to bring the Forum Community in with some of the FaceBook communities through posting of tutorial videos in the forum. We encourage anyone interested in wanting to see more video content to put in a request in the Answers Video Tutorial Request Page here. Feature Requests can also be contributed to on the same site.